Dharamsala,Dalai Lama Home, Tibetan Buddhism, Dharamshala Cricket Stadium,Spiritual Retreat,Dharamshala India,Dharamshala Travel, Yoga,Meditation,Volunteer India,Places to see in Dharamshala,Dharamshala Hotels ! 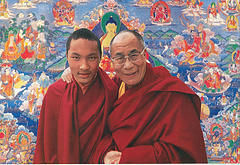 HH 14th DALAI LAMA and HH 17th KARMAPA in Dharamsala ! Enjoy Dharamshala Time in Dharamshala India with interesting visits to Dalai Lama Temple and Hindu Shrines ! The history of this Dalai Lama town, Dharamshala in India dates back more than 3,500 years. The earliest known tribe was the “Dasu Warriors”, who were later assimilated by the Aryans. In 1849, the British posted a regiment here, but this small township did not remain a military base for long ! The pine-clad hillsides continued to flourish as a romantic – health resort for the English Sahibs and Mem-Sahibs. The two main areas at that time were Mcleodganj , named after Lt. Governor of Punjab, David Mcleod and Forsythganj. Lord Elgin, Viceroy of British India liked this sleepy hamlet so much that it was his desire to be buried here at St. John's Church in the Wilderness in 1863. 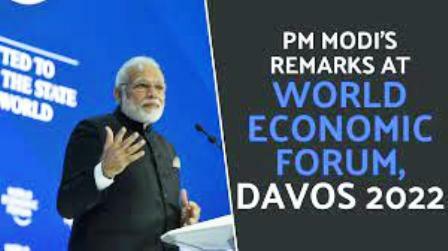 After India achieved Independence in 1947, His Holiness the 14th Dalai Lama of Tibet on his “famous” flight to freedom from Potala Palace, from his native place of birth – TIBET, under Communist occupation…came to India in 1959. In March 10, 1960 His Holiness the Dalai Lama of Tibet along with his people came to Dharamshala India and made it His Home..in effect the Tibetan Govt-in –exile. Today, thousands of Tibetan refugees have made this scenic Kangra Valley, their home. With them came the different..Tibetan flavours of Lhasa making it popularly known as the Little Lhasa of Tibet.! The Dalai Lama Temple is a major attraction in this hometown of the Dalai Lama in India.It is visited by many tourists through out the year. So, while you are planning your India Holiday with us, catch the most cheap flights to India and visit us in Dalai lama Dharamsala Miniguide. KANGRA...Dharamshala, lies on the spur of the Dhauladhar Range of the Outer Himalayas of India. This beautiful range rises out to a height of 5200 metres (17,000 feet). This Spiritual Capital of the World is in the Kangra District of the Northern Himalayan state of Himachal Pradesh. Your Dharamshala time will pass very quickly with ancient and interesting places to see in Dharamshala. *The golden age of Kangra was under The Maharaja Sansar Chandra Katoch, who started his glorious rule in 1775 A.D. as a minor. During his rule Maharaja Sansar Chandra defeated Saif Ali Khan and took possesion of his ancient family fortress - THE KANGRA FORT ! With this he established the old proverb.." He who holds the Fort rules the HILLS !" As one of the most powerful Pahari Rulers of the World, he established the "Chattis Karkhanas"..36 factories of Hill handicrafts, out of which was the famous Kangra Miniature Paintings. These were inspired by his love for a common Gaddi Shepherdess ! *One of the most famous and unique Ancient Hindu shrines of the World..the Jwala-Muhki Temple, is near Dharamshala in Kangra district. For centuries, The Eternal Flame coming out of the high rocks of Himalayas..has welcomed millions of Faith followers ! Dharamshala Time will pass very quickly with ancient and interesting places to see in Dharamshala. The Valley attracts Tourists from all over the world, and is famous for enjoying Buddhist Study Tours, Soft Adventure Dharamshala treks and Health & Healing.. Yoga Meditation Holidays in India ! So book your flights with us now and enjoy your Dharamshala Travel in the heavenly city of Dharamshala India. Our 'Music in the Skies" program offers an excellent spiritual retreat with Volunteering and interesting places to visit in Dharamsala..! There is so much to see here which can give you an interesting walk 'Down History Lanes..' The ancient 200 years old Shiva Temple in Mcleodganj, The healing energy of Dal Lake where hundred year old fishes...stay untouched ! Attain, 'Karma Credit' by feeding them and meditate in the spiritual ambience of Mother Nature and centuries old Hindu shrines. Discover the HighEnergyZones(Shakti-Peeths)manifestations of the Goddess Durga/Kaali at the historical Temples of Brajeshwari Kangra,Chamunda Devi and Eternal Flame Temple of Jwalamukhi !! *Dharamshala Guest Comment- "In Dharamsala we enjoyed the peace, the views, the energy which touched us, after the noise of Delhi. The room, and..Tibetane le cuisinie. Speciale delicace pour le Cuisinier: deliciese omelette et merveilleus poisson de la troute!" ...Ms Pon Pascale and Sylvie Andre (Paris) Date: April 08th, 2006..Guests of Himalayan Home,Vidya Niwas. Dharamsala...a 'Spiritually Energizing Buddhist' Holiday.. 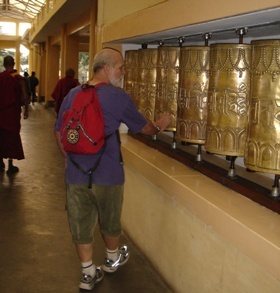 There are many Buddhist Cultural and Health & Healing spots in Dharamsala. You can pray for PEACE at the Dalai Lama Monastery.. Attend the Vedic Teachings at Chinmaya Ashram..Visit Tibetan Tantric Monastery..Feel the magical aura of the Holy Oracle of Dalai Lama. 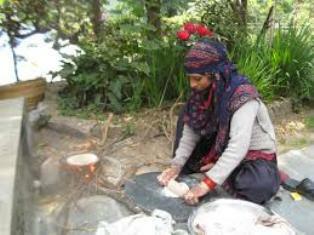 Enjoy Tibetan cooking classes..Local Gaddi DHAMS (Village Feast), Relax yourself with refreshing nature walks among green paddy fields, unexplored tea gardens in the quiet beauty of the Hills and climb soft day treks to the Ancient Snake Temple and Snow covered Moon peak in the India Himalayas. EDUCATING THE HEART AND MIND ! This town of the Dalai Lama, has inspired the imagination and interest of the young and the old, the celebrities, the students and the individual explorers from all walks of life ! There is so much to discover...Study Tibetan Buddhism, talk to the Tibetan Artists of Norbulingka,Tibetan Astrological Charts and visit the monastery of HH Karmapa. Treat yourself to a complete Spiritual Retreat in India and relax with Yoga, Meditation, Ayurveda and Tibetan medicine and massage ! Heal yourself with Volunteering with the local communities. The best way to enjoy your Dharamshala Travel in this scenic Valley is to stay in a centrally located accommodation where you can enjoy all your holiday activities in Upper and Lower Dharamsala India. For exclusive hospitality in Dharamshala Hotels, Vidya Niwas ..a Mountain Home Retreat is a good choice. Complete your Dharamshala Travel Buddhist Tour in India, with a trip to Buddhist destinations in Lumbini, Bodhgaya and Sarnath. *HEIGHT : Lower Dharamsala :1380 m and Upper Dharamsala "Mcleodganj, Naddi Village" :1800 metres. *ROADS : Most of this Valley is connected by good network of roads and by lanes. *SEASONS : Spring - February/March/April, Summer - May/June, Monsoon - July/ August, Autumn - September/October/November, Winter - December/January. *TEMPERATURE : Maximum : 30/34 degree celcius Minimum : 04/05 degree celcius. *ANNUAL RAINFALL : Varies between 200cm to 290cm. *LOCAL LANGUAGE : English, Hindi, Pahari & Tibetan. *CLOTHES TO WEAR : Summer - Light cotton with light jacket, Winter : Warm woollens with heavy jackets. *MONSOON : Umbrella and rain jacket is a must. *TRANSPORT : Local taxis and Government and Private Buses are available. *CUISINE :Indian,Tibetan,Chinese,Korean,Japanese,Italian,Israeli and Continental along with Local fruit wine and cider, beer and liquors. Lots on the table to make your Dharamshala India, Dharamshala Restaurants experience, a memorable holiday on the palate. *MONEY EXCHANGE AND TRANSFER : Local banks here can exchange travelers cheques and currency notes. ATM machines and Western Union Money transfers are available for quick money exchange or transfer. (VISA,AMEX,MASTERCARD) are valid in some places. *MEDICAL ASSISTANCE : Private clinics and the Zonal Govt.Hospital are available. *POSTAL & COURIER SERVICES : Available at Local Head Post Office. There are some private couriers also. *ACCOMODATION : Commercial Dharamshala Hotels and Budget Guest houses are available. *SPECIAL HOSPITALITY : Himalayan Retreats and Homes are available in Dharamsala. *ELECTRICITY : The Power Voltage here is 220-250 Volts. You do require an adaptor when you bring your personal electrical items and your Laptop/Ipod..! You can buy one locally here in the Market. 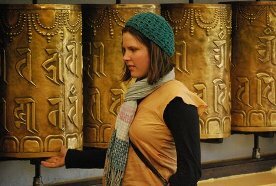 *VOLUNTEERING SERVICES : There are numerous Tibetan and Local centers where you can volunteer your services in Dharamsala. *ANIMAL CARE : There are Government and Private Dog Clinics available for your pets care. You can also volunteer in the Animal Care Centers, if you are an animal lover! *SPORTS VENUE : The Dharamsala Cricket Stadium and the Police Ground hold international and national sport activities. For More on, In and Around Dharamsala/Palampur...CLICK HERE to view ! 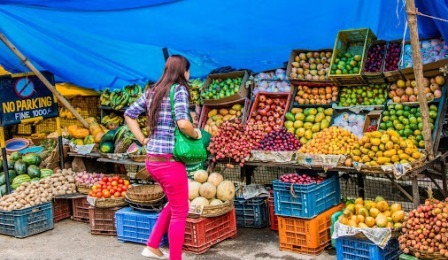 Stroll around the Tibetan Market in Mcleodganj Dharamsala,..or hunting for fruits in the summers there is no place better than the Fruit n Vegetable market...all fresh for your liking and nothing better than a fusion of Indian n Tibetan salads on the tongue..! Contact us for your Dharamshala India Tour..
What's happening in Dalai-Dharma-Abode..Home Page..Click here ! Look into any Travel section of Mountain travel and you will discover Dharamsala, the Spiritual Capital of the World in India. Whats Cooking..?? Weekend palate pleasers April 2019..! With the sunshine in your garden....it is time to enjoy the flavor delights of Himalayan home made hot food on the table..!
" Share your Knowledge...its the way to Immortality..!!" *His Holiness The Dalai Lama. Shakti Peeth (Energy Zone), Dharamsala.. Spiritual Energy (Shakti), as a source of rejuvenation for the Body, Mind & Soul, is as old as the evolution of mankind. Dharamsala has been blessed by five Energy Zones (Shakti Peeth), the ethereal power manifestation of the Mother Goddess, 'Durga'! Humiliated and aggrieved in her father's home'Sati', the consort of Lord Shiva, immolated herself in the holy pyre. 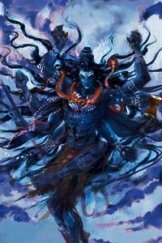 The passion and the wrath of Lord Shiva knew no bounds, in its profound suffering and grief.He carried her body all over the Universe. Wherever her body parts fell, it became a sacred Holy site. 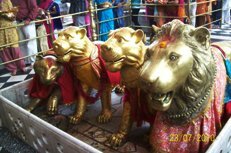 Shakti Peeth..Chamunda Mata Temple, Dharamsala..
Shakti Peeth..Brijeshwari Temple, Kangra, Himachal Pradesh.. This ancient Shakti Peeth (Energy Zone), located in old Kangra town 20 Kms from Dharamsala, celebrates the victory of Shiv Shakti over the demon Jalandhar. As per legend the temple was dedicated in the old town of Susharmapur in the Mahabharata Epic to all the devotees of Lord Shiva and Goddess Durga, as per the wish of the dying demon. 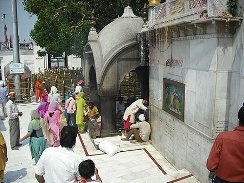 Shakti Peeth..Jwalamukhi Temple, Kangra, Himachal Pradesh.. 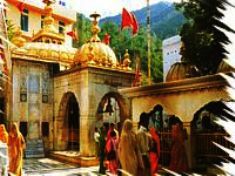 Situated around 60 Kms from Dharamsala town, the Eternal Flame Temple of Jwalamukhi is, the revered shrine of many devotees around the world. It is believed that the temple was inaugurated by Samrat Bhumichandra, in a dense forest as a virtual manifestation of the Goddess 'Sati'. Perceived as the holy site where, her tongue fell, the eternal flames emerge from the rocks radiating energy in many sacred zones, all around the temple as the Gorakh Tibba. The Pandavas also visited this holy shrine and built the Gateway of the temple. Shakti Peeth..Chintpurni Temple, Himachal Pradesh.. 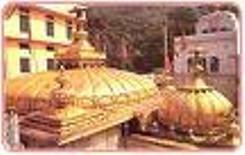 The temple dedicated to Mata Chintpurni Devi is located 60 Kms from Dharamsala. Mata Chintpurni Devi is also known as Mata Shri Chhinnamastika Devi. 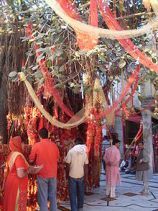 Devotees have been visiting this Shaktipeeth for centuries to pray at the lotus feet of Mata Shri Chhinnamastika Devi. It is believed that the divine energy in the Temple is a blessing from the sacred feet of 'Sati' which fell there. The temple was an inspirational endeavor by Pandit Mai Das, who saw the Goddess in his dream. Shakti Peeth..Naina Devi Temple, Himachal Pradesh.. 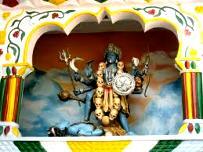 The Temple of Shri Naina Devi Ji is situated on a hilltop in the Bilaspur Distt. of Himachal Pradesh in India.It was built by a Gurjar Shepherd. The place is sacred as the holy eyes of Goddess 'Sati' fell here. Every year during Nav-Ratra festival in October millions of devotees come to pay their homage. 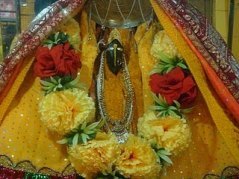 Shakti Peeth..Baglamukhi Mata Temple, Himachal Pradesh.. It is one of the ancient Baglamukhi Temple situated in Bankhandi (Himachal Pradesh India). It is said to be “mahabharat kaleen temple” which as per legend was built by the 'Pandavas'. It is 46 Kms from Dharamsala in Kangra district. The mother Goddess in the form of a crane is represented as destroying the evil within us and the enemies around us. Her patronage helps us in achieving our goals. For your Pilgrimage Tour to India..Contact Us..! Food culture in Dharamsala India..interesting weekend palate pleasers..